Sketch of a swimming theropod dinosaur on the shores of the Cretaceous lake Cameros in Spain. Drawn by Guillaume Suan, University Lyon1, France. An extraordinary underwater trackway with 12 consecutive prints provides the most compelling evidence to-date that some dinosaurs were swimmers. 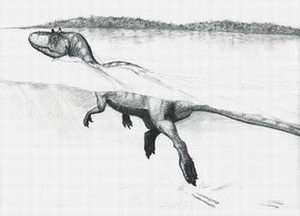 The 15-meter-long trackway, located in La Virgen del Campo track site in Spain's Cameros Basin, contains the first long and continuous record of swimming by a non-avian therapod dinosaur. A team led by Rubén Ezquerra, Fundación Patrimonio Paleontológico de La Rioja, La Rioja, Spain, discovered the prints in an area long known for its abundance of terrestrial dinosaur trackways dating from the early Cretaceous 125 million years ago. The team's findings are reported in the June issue of Geology. The trackway consists of 6 asymmetrical pairs of 2-3 scratch marks each. Each set of scratch marks, preserved in a layer of sandstone, averages approximately 50 centimeters in length and 15 centimeters wide. The spacing between them suggests an underwater stride of 243-271 centimeters. According to co-author Loic Costeur, Laboratoire de Planétologie et Géodynamique de Nantes, Université de Nantes, France, the S-shaped prints paint a picture of a large floating animal clawing the sediment as it swam in approximately 3.2 meters of water. Ripple marks on the surface of the site indicate the dinosaur was swimming against a current, struggling to maintain a straight path. "The dinosaur swam with alternating movements of the two hind limbs, a pelvic paddle swimming motion," said Costeur. "It is a swimming style of amplified walking with movements similar to those used by modern bipeds, including aquatic birds." The question of whether dinosaurs could swim has been researched for years. Until now, however, very little hard evidence existed documenting the behavior. Several earlier discoveries were later found to have been produced on dry ground or categorized as ghost traces, possible undertracks preserved in lower layers of sediment. "The trackway at La Virgen del Campo opens the door to several new areas of research," said Costeur. "New biomechanical modeling will increase our understanding of dinosaur physiology and physical capabilities, as well as our view of the ecological niches in which they lived."